Brian Lynam, known also as Brian McNeil and born in Britain 10.11.1933, died in London in November 2015 at the age of 82. A worker all his adult life, Brian fought against the oppression of the employers and of capitalism. He gave courage to countless comrades in Britain and beyond. Through his trade union and political involvement, he contributed to the struggle for the Marxist transformation of the Labour, social-democratic and communist movements of the world. Brian joined the air force at 16. On search and rescue missions around Singapore and Malaysia, he was trained in telecommunications and the use of Morse. There, he learnt also about the Chinese Revolution and became Maoist. He was reproved by the army and finally expelled for insubordination. In London around 1956, he joined the Paddington Labour Party. Around 1960, he became a miner at the Gelgiging-Cotgrave pit in Nottinghamshire where he joined the NUM. In 1966, Brian started work as ‘unskilled’ at Austin Longbridge in Birmingham, and joined the AEF (which became the AEU and then the AEUW). 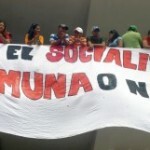 With teams of other trade unionists, he demanded that the profits of automation should go to the workers in the form of more pay and less working hours. The bosses identified him as an ‘agitator’ and eventually gave him the sack. Brian had joined the Internationalist Group of the IV International by that time. With some comrades of that group, he decided to support the positions of J. Posadas, then leader of the Latin American Bureau of the IV International. 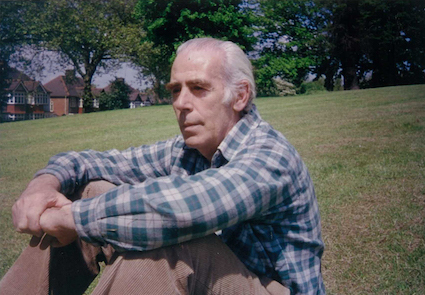 In 1959, J Posadas had visited Britain and met some of those comrades, Brian amongst them. 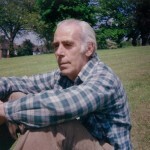 When J Posadas founded the British section of the Trotskyist-Posadist IV International in 1963, Theo Melville – who died in 2000 – and Brian Lynam were two of its pillars. J Posadas insisted on the preservation of essential theoretical Marxist foundations like: 1) the preoccupation to assess each national or local event in the context of the world process of the revolution, 2) unconditional support for the process of partial regeneration in the Soviet Union – a regeneration that was then taking place, and continued until practically the end of the USSR in 1989, and 3) confidence in the socialist future of humanity, confidence that the masses are ripe for the construction of socialism, and confidence in that socialism is a necessity of life. In 1968-69, Brian started work at the Vauxhall car company in Luton, Bedfordshire. There, he joined the NUVB (Nat. Union of Vehicle Builders) and started the publication of The United Car Worker. This simple pamphlet did not please the trade union bureaucracy because it called for trade union democracy and the right to recall the trade union delegates at mass meetings. It also demanded the right to worker’s training and education in the enterprise, so that the workforce could become able to control and direct the company. Sacked again after a while, and put on the blacklist, Brian changed his name and became Brian McNeil; but this did not stop him being sacked from everywhere else just the same. Brian McNeil at around the age of 60. With his wife Marie Moreau, he moved to London and found work on the nationalised railways. 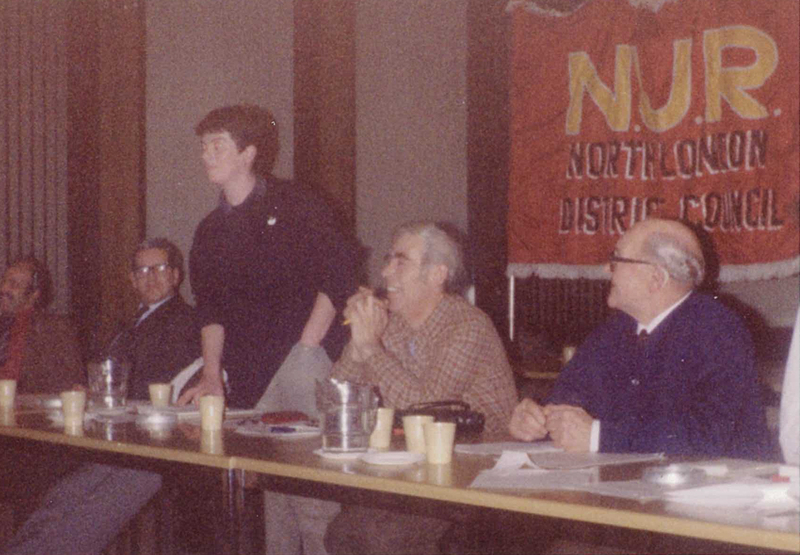 There he joined the NUR (now the RMT) and after a few years, was elected president of the North London NUR District Council. 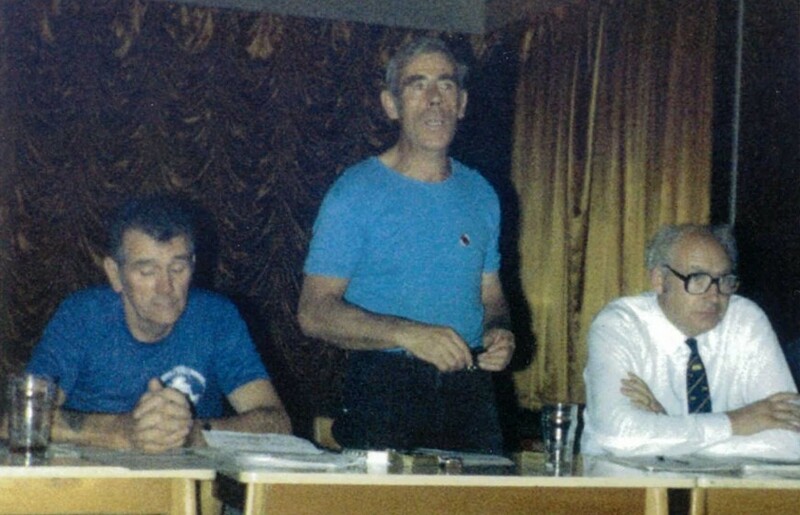 He can be seen speaking on the above picture with Jimmy Knapp (on his left) in a white shirt. With most of his union comrades, Brian insisted on a fully integrated national transport service for Britain – as a service for people, and not for the profits of the private sector that was growing then. 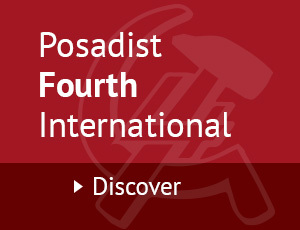 In 1963, the British section of the Posadist IV International had been created, and named the Revolutionary Workers Party (T). That same year, the section had started the publication of its paper, Red Flag, organ of the RWP (T). Red Flag would continue to appear monthly for 37 years, until the year 2000, nine years after the death of J Posadas in 1981. The whole file of Red Flags can be read on the site: quatrieme-internationale-posadiste.org, or by accessing that site from this blog. As part of the world organisation of the International, which reached up to 17 sections at one time, J Posadas worked with infinite patience at the building of the British section. 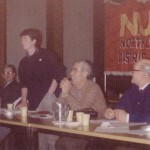 As a worker, Brian saw the need to adhere to the International of Posadas, to help with the formation of revolutionary currents and tendencies in the world, and most particularly in the Labour Party. Such are still the aims of the Posadists today. Brian chairs an NUR meeting. Brian gave all his strength to the construction of the British section. He attended most of the conferences of the International, the meetings, the cultural studies and the cadres’ schools. As a worker leader in the British section, he dedicated his life to the task of writing and publishing orientations useful to the local, regional and national trade unions. He led strikes, struggles and rebellions of the workers against the bosses’ violence, whilst giving ideas, programmes and objectives conducive to the creation of leaderships ready for the socialist transformation of society. Brian played his part in the tenacious struggle of J Posadas to stimulate the return of the world communist movement to Marxism. This is why he participated in presenting the books of J Posadas at various book fairs, as in Moscow and Havana. He travelled twice to Cuba as a Union delegate as well, to salute, stimulate and support the communist, anti-imperialist and revolutionary struggle of Cuba. The Posadists pay homage to comrade Brian for his life dedicated to the struggle for socialism and for the construction of the Posadist IV International. The latter represents an organisational, theoretical and political contribution useful to humanity. In the end, comrades who have lived like Brian do not die. Forward!